Sometimes it feels like there is no progress toward our goals, no matter how many actions we take. We wrote a few pages only to find out that we have to revise them all, from the ground up. Or worse, the entire day’s work had to be re-written. Those moments can bring you to the point of wanting to give up, yet we press on. If we do not, if we allow this moment of defeat, the moment of what feels like a complete stand-still to actually bring us to a complete stop, we will never experience the truth of how close we were to succeed. Success is at the other end of those moments, the moments that feel motionless, and frustrating. We, as writers and artist need to remember that failures and temporary setbacks are not wasted time, they are still motion forward, even if only in lesson and experience. And we are indeed making progress, and it might be faster than we think. The above poster is available on Zazzle. Please support independent artists, thank you! It’s nearly May and school is almost out – that means summer is just around the corner! 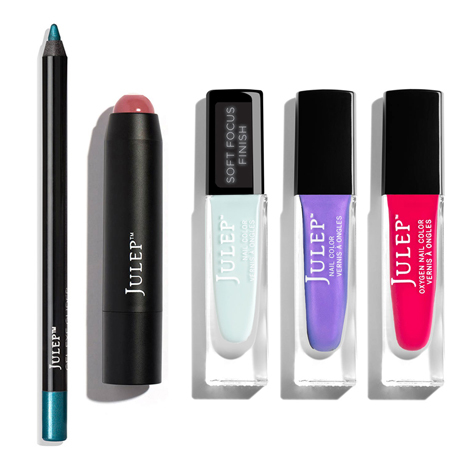 Get in the mood for sunshine with this bright Cue in the Color 5-Piece Beauty Gift ($78 value) which is FREE when you join Julep and pay for your first month ($24.99). When you join Julep, you’ll get a box of gorgeous and good-for-you beauty, nail, or skin care products delivered to your door every month. Julep offers the only full-size and fully-customizable beauty box out there, so you get what you want every month! To redeem your Cue in the Color 5-Piece Beauty Gift, add the gift to cart and use code COLORLOVE at checkout. Then on May 20th, you’ll log into Julep to select the products to include in your first beauty box. August Is Productivity Month – How Productive Are You? Great advice and reminder for all writers, because as much as we are indeed unsure of all we are doing, we are definitely accomplishing more than we could ever imagine. thank you very much, I appreciate your kind words. I am glad I ran across your blog yesterday and decided (on a whim) to join in this idea of posting for the #1word link up. What a great idea that is by the way. I am looking forward to connecting more often, have a wonderful day! This is something we need to be constantly reminded of – really there is no such thing as failure. But oh how it feels like it at times. it sure does feel like it at times – thank you for stopping by, hon – blessings!